Good oral health is as important for your dog as it is for you. Unless you routinely feed your dog raw meaty bones, raw chicken or other animal parts containing bones or cartilage, you will probably need to routinely brush his teeth. Avoid the use of rawhide and most synthetic chew products as they can be harmful. Daily brushing is best, but at a minimum you should brush at least twice weekly. 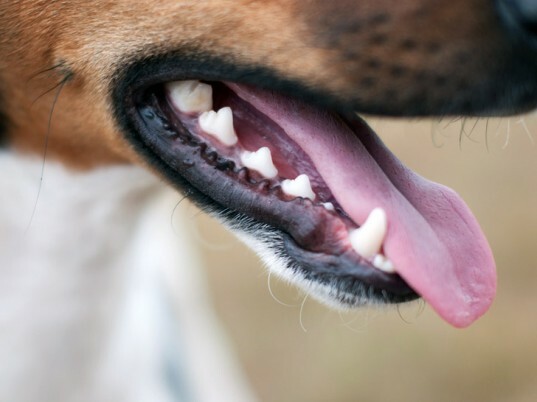 Take a few minutes to inspect your dog’s teeth. You’ve got some brushing to do unless they are white and sparkling all the way to the gum line! You will need a good doggy toothbrush and toothpaste made specifically for your dog – don’t use human toothpaste. While there are many alternatives to doggy toothpaste, you should check them out closely to make sure they are safe to use. One alternative that is safe is coconut oil – dogs love the taste and it works well. Coconut oil is particularly useful in dogs with gum disease as it can help to reduce bacteria in the mouth. If your dog is not cooperative initially, just do the best you can. If you keep at it, he should become more cooperative with time. To get him used to brushing, you might want to periodically check his teeth throughout the day without brushing so that he gets used to you pulling the fleshy part of the skin around his mouth (his flew) back and inspecting his teeth. 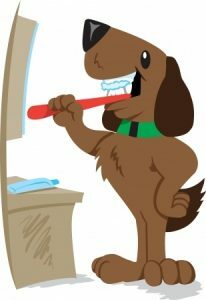 To learn the proper technique to use when brushing your dog’s teeth google ‘brush dog’s teeth’ and you will find several videos showing you how to do it. July 2015 Tip – Keep Cool! I really like the suggestion of coconut oil. My pups will probably enjoy the change and hopefully not display their wishes to be doing just about anything else. Thank you for the helpful tip! Feed raw and you will never have to brush teeth!